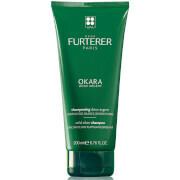 Cleanse and balance oily-prone hair with the René Furterer CURBICIA Lightness Regulating Shampoo, an oxygenating formula that performs a deep cleanse to leave the hair and scalp feeling fresh and purified. Formulated with Curbicia extract and a refreshing cocktail of Thyme, Rosemary, Orange and Clove essential oils, the shampoo lifts away dirt, oil and impurities while regulating excess oil production to help extend time between shampooing. 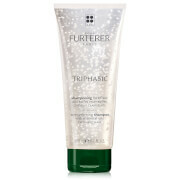 Cleansing and balancing, the shampoo will leave hair feeling refreshed, soft and shiny with restored volume and radiance. When used regularly, it may help reduce the frequency of shampooing. Apply to wet scalp and hair. Massage into scalp, work into a lather and then rinse. Proceed with a second application, leave on for 2 to 5 minutes. Rinse thoroughly. Water (Aqua), Sodium Laureth Sulfate, Sodium Cocoamphoacetate, Glycol Palmitate, Cocamide Mipa, Cetearyl Alcohol, Limonene, Sodium Chloride, Coco-Glucoside, BHT, Camphor, Chromium Oxide Greens (Ci 77288), Citric Acid, Citrus Aurantium Dulcis (Orange) Oil (Citrus Aurantium Dulcis Oil), Cucurbita Pepo (Pumpkin) Seed Oil (Cucurbita Pepo Seed Oil), Eugenia Caryophyllus (Clove) Bud Oil (Eugenia Caryophyllus Bud Oil), Eugenol, Iron Oxides (Ci 77499), Linalool, Methylparaben, Phenoxyethanol, Polyquaternium-22, Propylparaben, Rosmarinus Officinalis (Rosemary) Leaf Oil (Rosmarinus Officinalis Leaf Oil), Sodium Benzoate, Sodium Cetearyl Sulfate, Sodium Lauryl Sulfate, Thymus Vulgaris (Thyme) Flower/Leaf Oil (Thymus Vulgaris Flower/Leaf Oil).